For further information see "Additional information." The thresholds of RWYs 05L and 05R are shifted behind the road. The road must be overflown during take-off and landing in minimum altitude 15 m from the lowest part of aeroplane or towed object. Parallel operation on RWY 05L/23R or RWY 05R/23L is strictly forbidden. 1.1.1All LKLT users are required to familiarize themselves with the LKLT Airport Rules, which are available at www.letnany-airport.cz in its current form. 1.1.2Aerodrome Traffic Zone (ATZ) is not established. Aerodrome LKLT is located in MCTR Kbely and a flight along traffic circuit goes through CTR Ruzyně. 1.1.3Outside operational hours of AFIS LKLT, procedures for VFR flights are applied like procedures to/from aerodrome Kbely with a permanent two-way radio contact with MTWR Kbely. Route of arrival/departure is subject of ATS Kbely clearance. See AIP CR, AD 2, aerodrome Kbely, procedures for VFR flights. Departures from LKLT possible only until sunset, arrivals at the AD possible until the end of civil twilight according to LKKB unit. 1.1.4In operational hours of AFIS LKLT, the flights along traffic circuit, which is followed by direct flight to/from point MIKE, are applied according to AFIS LKLT instructions. Maximum altitude of these flights is 2000 ft AMSL. 1.1.5The flight on traffic circuit of LKLT creates conflict traffic for flights to/from RWY 06/24 of LKPR, RWY 06/24 of LKKB and RWY 10/28 of LKVO. 1.1.6Pilots are requested to strictly maintain the trajectory of flight along traffic circuit and to strictly maintain maximum given altitude - see VFR-AD-LKLT-VOC. 1.1.7The thresholds of RWYs 05L and 05R are shifted behind the road. The road must be overflown during take-off and landing in minimum altitude 15 m from the lowest part of aeroplane or towed object. 1.1.8Pilots flying according to FPL are obliged to request activation / termination of FPL by AFIS LKLT or outside operational hours of AFIS LKLT by MTWR Kbely. 1.1.9The aerodrome operator guarantees AD fire category 2. The operator does not guarantee fire category 3 or higher. 1.1.10The aerodrome operator does not provide security checks of passengers or aircraft. 1.2Before and after the published operational hours of AFIS unit of the aerodrome Letňany, departures and arrivals are allowed only after submitted and then approved request sent to the e-mail address info@letnany-airport.cz 12 hours in advance. The request for arrival and departure outside of the operational hours shall be submitted in the operational hours. Landing (except emergency and safety landings) without appropriate clearance outside of the operational hours is considered as a violation of airport regulations, which is available on http://www.letnany-airport.cz. The aerodrome area is closed outside the operational hours. 1.3.1Flights over villages Čakovice, Kbely, Miškovice, Vinoř, Satalice, Horní Počernice and housing estate Prosek, by powered aeroplanes, helicopters and sport flying equipment are not allowed, if it is not neccessary by operational and safety reasons. 1.3.2Pilots-in-command are obliged to initiate take-off from the threshold of relevant RWY. 1.3.3After take-off climb with maximum gradient while maintaining safety of the flight. 1.3.4Power engine tests which are not referred to the procedure of appropriate departure are in time from 1700-0800 (1600-0700) forbidden. 1.4.1.1Arrivals and departures are possible only with two-way radio contact on channel AFIS LKLT 120,335, outside operational hours on CH MTWR Kbely 120,880. 1.4.1.3Pilots-in-command of aircraft entering to MCTR Kbely are obliged to maintain height 1000 ft/300 m AGL, but maximum altitude 2000 ft AMSL, unless otherwise stated by ATS Kbely. 1.4.1.4Point MIKE is desiganted for arrivals and departures to/from AD LKLT from/to area of class G and class E. Maximum altitude of flight outside MCTR Kbely must be 2000 ft AMSL. 1.4.1.5Trajectory of direct flights via points LIMA, UNIFORM, ROMEO is subject to a clearance issued by MTWR Kbely. 1.4.2.1Pilots-in-command are requested to adhere to noise abatement procedures. 1.4.2.2Arrivals are carried out from point MIKE either directly to final turn with landing on RWY 23L or 23R or to downwind turn with landing on RWY 05L or 05R. 1.4.2.3Entry point MIKE - before overflying MIKE establish two-way radio contact with AFIS LKLT or outside operational hours with MTWR Kbely. Continue to corresponding circuit turn according to RWY in use. Arrival cannot be carried out to the south of road Brandys nad Labem - Kbely. 1.4.2.4Entry point LIMA - continue to point MIKE outside MCTR Kbely and continue according to 1.3.2.3. It is not possible to enter MCTR Kbely without two-way radio contact with MTWR Kbely. A direct flight, with two-way radio contact with MTWR Kbely, can be permitted on request from entry point LIMA to centre of AD Kbely or Letňany with further inclusion in traffic circuit of AD Letňany. 1.4.2.5Entry point ROMEO or UNIFORM - continue to point LIMA outside MCTR Kbely and then according to 1.3.2.4. A direct flight, with two-way radio contact with MTWR Kbely, can be permitted on request from entry points ROMEO or UNIFORM to centre of AD Kbely or Letňany with further inclusion in traffic circuit of AD Letňany. 1.4.2.6Arrivals from different directions are subject to clearance of MTWR Kbely. 1.4.2.7Approach and landing of helicopters must be carried out to RWY in use. 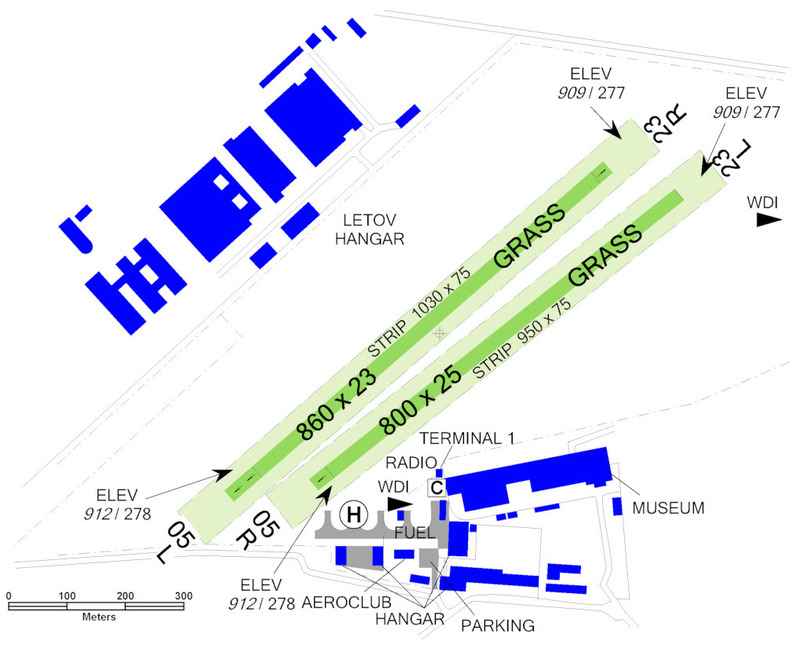 Air taxiing and parking on highlighted places in accordance with AFIS LKLT instructions. 1.4.3.1Pilots-in-command are requested to adhere to noise abatement procedures. 1.4.3.2Departures are carried out along the traffic circuit to the base turn in case of departure from RWY 23L and 23R, or to crosswind turn in case of departure from RWY 05L and 05R and further to exit point MIKE. 1.4.3.3Departures to exit points LIMA, UNIFORM and ROMEO can be carried out from point MIKE outside MCTR Kbely. 1.4.3.4At two-way radio contact with MTWR Kbely change from route defined by 1.3.3.2. to direct flight to exit points LIMA or UNIFORM or ROMEO can be permitted. 1.4.3.5Departures to different directions are subject to clerance of MTWR Kbely. 1.4.3.6Take-offs of helicopters must be carried out from RWY in use. Air taxiing according to AFIS LKLT instructions. 1.4.3.7Pilots-in-command are requested to contact the AFIS unit before commencing taxiing from the stand due to traffic safety during parachute jumping. 1.5.1.1Traffic circuit is carried out to the right for RWY 23L and 23R or to the left for RWY 05L and 05R. 1.5.1.2Traffic circuit altitude is at maximum 1900 ft/580 m AMSL. 1.5.1.3Aircraft can use an extended traffic circuit highlighted by dashed line (see chart VFR-AD-LKLT-VOC) for approach and landing to RWY 05. 1.5.2.1Ultralight aircraft up to MAX IAS 110 km/h carry out the traffic circuit to the right for RWY 23L and 23R. 1.5.2.2The traffic circuit height for ultralight aircraft is 500 ft/150 m AGL. 1.5.2.3A shape of traffic circuit shall enable to land at the aerodrome from the downwind turn in case of engine failure. If performance of ultralight aircraft does not allow to adhere this requirement the pilot-in-command of ultralight aircraft is obliged to carry out traffic circuit in accordance with 1.4.2.1. a 1.4.2.2. 1.5.3.2The traffic circuit altitude for glider is at maximum 1900 ft/580 m AMSL. 1.5.3.3The traffic circuit of gliders shall not overfly the etension of road - beam LKKB and Brandys nad Labem. 1.6In the event of radio communication failure, pilot in command shall immediately leave Letňany Airspace to a part of airspace outside CTR Ruzyně and TMA Praha and lands as soon as possible at the aerodrome outside the stated airspace. After landing, the pilot in command shall immediately inform AFIS LKLT or MTWR LKKB. 1.7In case an aircraft is not equipped with 8.33 KHz aircraft transceiver, the crew of such aircraft shall not enter MCTR LKKB. 2.2Pilot-in-command of taxiing aircraft are responsible for maintaining safe distance between aircraft. If pilot-in-command is not sure, pushing or pulling of aircraft to safety place for preparation to departure is carried out. 2.3Outside operational hours of AFIS LKLT arrivals and departures to/from LKLT are permitted only with agreement of the aerodrome operator (check of AD serviseability). 2.4RWY 05L and RWY 23R are designated primarily for aircrafts with retractable gear. 2.5The area of the AD is fenced and is intended for long-term parking of aircrafts. 2.6Landing charges, parking (parking in hangar) charges and fueling are paid in cash or by cashless payment with card at Terminal 1 next to the TWR. 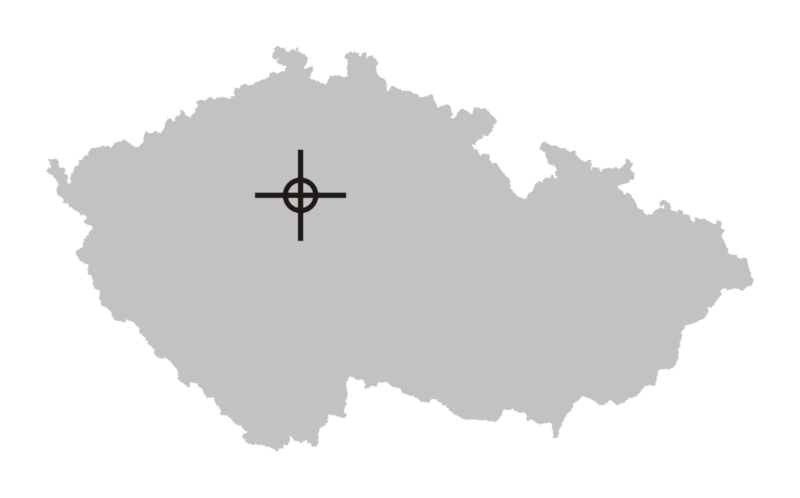 2.7Pilots-in-command are requested to adhere to published procedures particularly noise abatement procedures, flights outside build-up areas of mentioned villages, determined shape of traffic circuit and its altitude, the boundaries of controlled airspaces which are adjacent to the AD LKLT, i.e. CTR Ruzyne, MCTR Kbely and CTR Vodochody. 2.8Parallel operation on RWY 05L/23R or RWY 05R/23L is strictly forbidden. Flight outside aerodrome operating hours shall be reported in advance to: info@letnany-airport.cz and approved by the aerodrome operator. In particular months, the end of the operating period is limited by civil twilight if it occurs earlier than the published aerodrome operating hours. Furthermore, the aerodrome operating hours may be changed by NOTAM. First three hours free of charge. Other charges and charges for aviation gasoline according to current price list available at www.letnany-airport.cz.